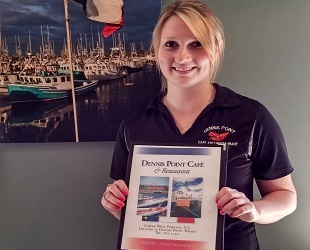 Dennis Point Café is owned & operated by Acadians. Here at the Dennis Point Café we only buy the freshest local products when available. Our seafoods come from our local processing plants, our lobsters come from local fishermen processed in federally approved plants. 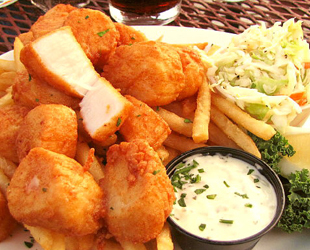 We hope that our homemade dishes satisfy your taste buds. Our food is prepared daily on premises like our rolls and pies and all orders are prepared only when ordered which takes time. We hope you like the spectacular view of the harbour, with around 95 fishing boats and bustling activity around the dock stays in your memory! Thanks for your visit. Hope to see you soon! Vernon d'Eon owner of Dennis Point Cafe. A little history on “Vernon d’Eon Lobster Plugs Ltd.” Vernon d’Eon, once a lobster fisherman, sold his fishing boat, fishing gear and fishing rights to pursue a risky venture. Vernon bought out his good friend Benoit Pottier’s business to manufacture and sell millions of wooden lobster plugs (pegs). Over 80 million plugs were made and sold in 1978 to markets from New York to Newfoundland. Wooden lobster plugs were used on lobsters. It prevented them from pinching with their claws prior to today’s rubber bands. Jade is inviting you to open our menu to explore all the delicious meals. Our menu is always evolving and from time to time we are adding new flavours to our menu. Also check out our facebook page for daily specials..
Come by and visit, for a coffee or one of our many teas, breakfast or for one of our meals. Eat where the locals eat. We serve all day breakfasts.